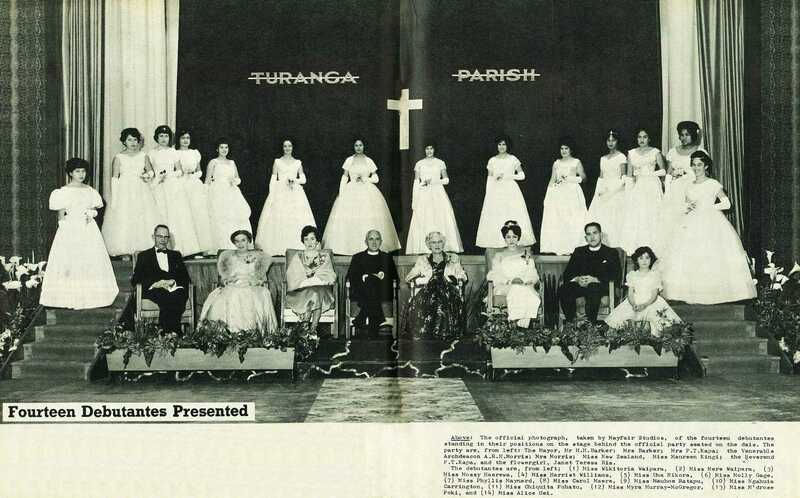 Fourteen debutan tes were presented to the Venerable Archdeacon A. R. H. Morris and Mrs Morris, deputising in the unavoidable absence of the Bishop of Aotearoa, the Right Reverend W. N. Panapa, at the Turanga Parish Ball held in the War Memorial Hall, Bright Street, recently. The foyer of the hall was decorated with massed arrangements of arum lilies and irises, and the entrance, with poinsettias and jasmine. Low troughs of brilliant red poinsettias and large arrangements of arum lilies, daisies, and greenery, surrounded the official dais. Each of the ladies in the official party was presented with a beautiful corsage by a little flowergirl, Janet Teresa Ria, after which, the debutantes entered the hall and curtsied in turn to Archdeacon and Mrs Morris, before taking their positions on the stage behind the official dais. On returning to the, floor, the debutantes performed a graceful mass-curtsy, and then danced the debutantes waltz to the strains of an 18th century minuet. 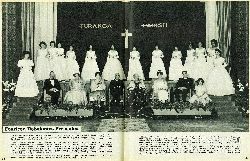 The official photograph, taken by Mayfair Studios, of the fourteen debutantes standing in their positions on the stage behind the official party seated on the dais. The party are, from left: The Mayor, Mr H. B. Barker; Mrs Barker; Mrs P. T. Kapa; the Venerable Archdeacon A. R. H. Morris; Mrs Morris; Miss New Zealand, Miss Maureen Kingi; the Reverend P. T. Kapa, and the flowergirl, Janet Teresa Ria. 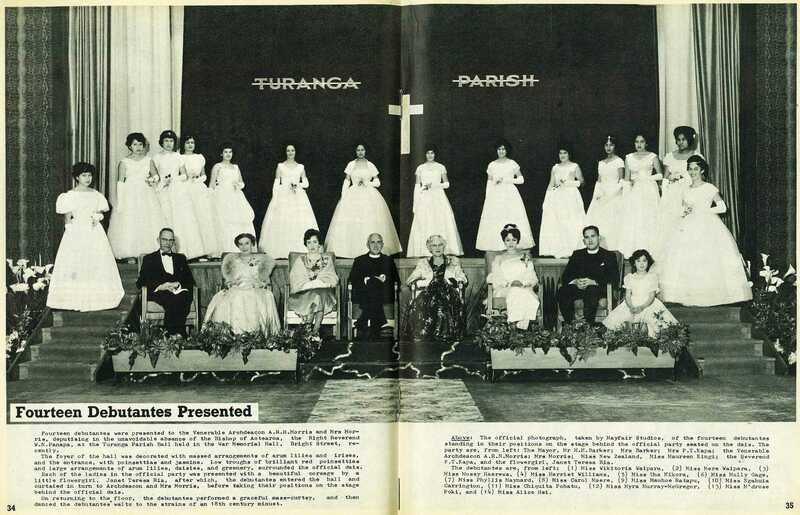 The debutantes are, from left; (l) Miss Wikitoria Waipara, (2) Miss Mere Waipara, (3) Miss Mossy Haerewa, (4) Miss Harriet Williams, (5) Miss Una Nikora, (6) Miss Molly Gage, (7) Miss Phyllis Maynard, (8) Miss Carol Maere, (9) Miss Mauhoe Ratapu, (10) Miss Ngahuia Carrington, (11) Miss Chiquita Pohatu, (12) Miss Myra Murray-McGregor, (13) Miss M'drose Poki, and (14) Miss Alice Hei.